My best friend from Jr.High School was Jewish. I remember her family celebrating things like Yom Kippur and Hanukkah. I remember them praying and singing in Hebrew, fasting, and making weird food on Friday nights. I remember going to synagogue with her, and feeling so religious, so close to God even though I had no idea what their Rabbi was saying or why they read their bibles in the wrong direction. I am so fond of those of memories the days before Easter, so tender towards my friends that practiced the Passover meal and Shabbat. I love looking back to remember, as I prepare my heart for what’s ahead. 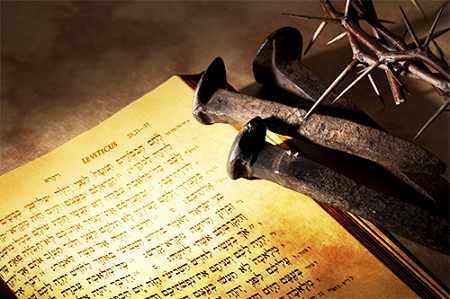 The days before Good Friday, I find myself lingering in the book of Leviticus. I know, not exactly the place most people spend their devotional time, but I can’t help it in this season. The old traditions, the feasts and festivals, the guilt offerings, the peace offerings, the sin offerings, they’re all a picture of what was, what is, and what is to come. Usually Leviticus gets a bad wrap from Christians, the book where all the “read through the Bible in year” people go to die. Leviticus is known as the book of laws and rules and rituals that we modern-day-too-busy-to-meditate-and-discover-meaning-on-our-own-people skip right over. I mean, what does a grain offering and feast of booths really have to do with us? Everything. It has everything to do with us. It has everything to do with Jesus, Good Friday, and Easter. Jewish friends, traditions, and Leviticus have everything to do with Easter. As I study Jewish traditions, laws, feasts, festivals, and offerings, I grow more and more convinced we can’t fully understand Jesus without Leviticus. I see so much more in Leviticus than boring, historical laws and festivals. I see Jesus all over Leviticus. I read through Leviticus with new eyes, eyes that appreciate what my Jewish friend’s family showed me, but eyes that see beyond just tradition, eyes that see Jesus, the Holy root. The one who came to fulfill the law. The One whom these traditions, celebrations, feasts, offerings, all foreshadowed. Jesus is all of these things. He is our High Priest, He is our offering, His blood is our atonement, a pleasing aroma, God’s firstfruits, He is our sacrifice, His death is in place of ours, He bore our iniquity, our flesh was unclean, He washed us with Living Water, restored us, consecrated us, sanctified us, invites us to dwell in the Holy place, tore the veil, redeemed us, and blessed us in the New Covenant. Jesus is all over Leviticus. Jesus fulfills Leviticus. Jesus is the better way, the better fragrance, the better priest, the better offering, the complete sacrifice. This Easter, don’t skip over Leviticus. Read through it. Slow down, observe, remember. Celebrate the Passover, mourn Good Friday, be still on Holy Saturday, and stand in hope on Resurrection Sunday. Look for Jesus in Leviticus and be filled with His presence all over.